In one of my last blog posts we dove into the best features to highlight when presenting the Visual Production Scheduler. In this post, I want to take the same kind of look, highlighting the three top features to show when demoing - not on the Visual Production but Visual Jobs Scheduler. 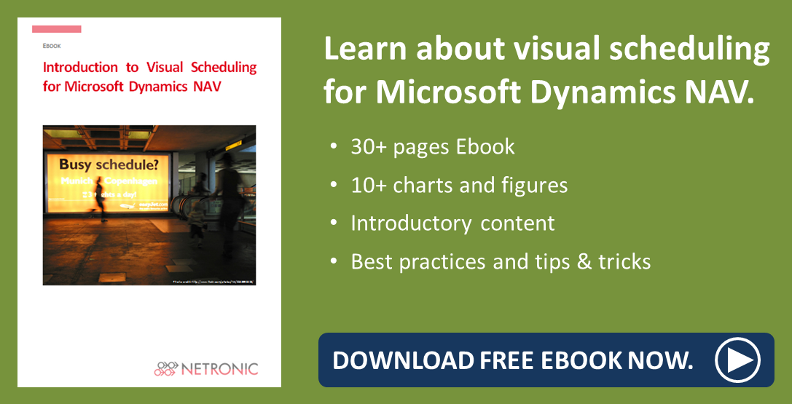 This blog post will dive specifically into the Visual Jobs Scheduler for Microsoft Dynamics NAV and the features which must be shown during demos to really win over prospects. So as I said in the previous post, visual scheduling is no longer a "nice-to-have." It is a "must-have." Therefore it's to be expected that a presenter of the Visual Jobs Scheduler for Microsoft Dynamics NAV jobs and resource planning modules will often hear reactions to three key features shown during demonstrations. These features are for me the basis of presenting the Visual Jobs Scheduler and its capabilities in NAV. My goal here is to explain and show them so that the next time you are demoing them you will be able to give the best possible demo. Feature 1: Seamless Integration: double-clicking anywhere in the schedule takes you to the corresponding tables and cards in NAV. The integration is expected and needs to be shown. It is often great here to show a job, expanded out, in the Visual Jobs Scheduler and then double click on it in NAV. You can then see the hierarchy in NAV directly reflected in the VJS. Feature 2: Scheduling Support via Links: creating links between job tasks. This is a functionality built into the VJS which doesn't exist in standard NAV. As in the video below, you can link a job task to another job task therefore creating a finish-start relationship. This means that as you move the first or preceding job task, the second or succeeding job task will move out automatically as it cannot start until its predecessor has finished. The ability to link will work on all levels throughout your job hierarchy. Feature 3: Unassigned Resources: assigning first to the group and then to the individual(s). Here is an additional feature which will make planning much easier in NAV. Though it does not show up in standard NAV, it can be easily utilized in the VJS. Simply adding the prefix $VJSRG$ to a resource's name will make the resource an "unassigned" resource. This means that the scheduler will recognize differently from your other resource living in resource planning. This functionality allows a planner to plan first at the resource group level, a function not available in standard NAV jobs, and then go in and assign group level tasks to individual resources at a later time. The major benefit being that the planner can first allocate work to the group level as it is often unclear early on in the job scheduling which specific resource will be complete the task(s). Okay so three key features to highlight when showing the Visual Jobs Scheduler.